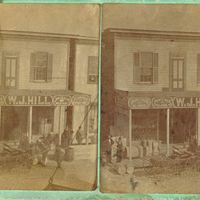 The W. J. Hill Store in Sanford, Florida. Although the earliest type of stereoscope dates back to 1838, this stereoscope card is from a Holmes-style stereoscope invented by Oliver Wendell Holmes, Jr. (1841-1935) in 1861. The two separate images are printed side-by-side. When viewed with a stereoscopic viewer, the images appear to create one three dimensional image. Items in the foreground appear closer, items in the background appear farther away, and the overall image is also magnified. Published by J. G. Mangold of Palatka, Florida. This stereoscope boasts, "Always on hand a good assortment of Florida Stereoscopic and large views of Residences, Groups, Picnics, Excursions, etc." Original 7 x 3.5 inch black and white photograph: Sanford Museum, Sanford, Florida. Digital reproduction of original 7 x 3.5 inch black and white photograph. Sanford Historical Society, Inc. Sanford. Charleston, South Carolina: Arcadia Publishing, 2003, page 39. “W. J. Hill Store.” RICHES of Central Florida accessed April 23, 2019, https://richesmi.cah.ucf.edu/omeka/items/show/4229.